Coating agent Protection which we released in the fall of 2015. Excellent water repellency, brightness, antifouling property, etc., clear change after construction is easy to approach the user, and it is very popular received the benefit that it can coat over coated vehicle as well. However, because it is designed by giving priority to its characteristics, it was undeniable that the element of durability was slightly inferior to other coatings. We are addressing that problem, and Protection/Advance Kit will guide you this time. 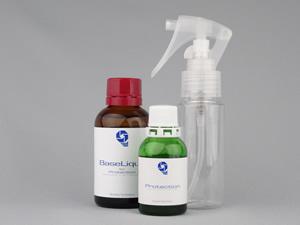 Protection/Advance Kit is a construction kit with a set of newly developed undercoat Base Liquid for Protection. It is a "Advanced" kit aimed at enhancing the coating effect and its endurance by using base liquid. Base Liquid serves as a primer. Base Liquid serves as a primer. It strengthens the adhesion of the body surface and Protection, enhances the coating effect, improves endurance. In addition, "Base Liquid" also has a degreasing & cleaning function, so it just replaces the base cleaner work of the normal kit, so workability will not change at all.